A loot offer from Bookmyshow and Amazon. 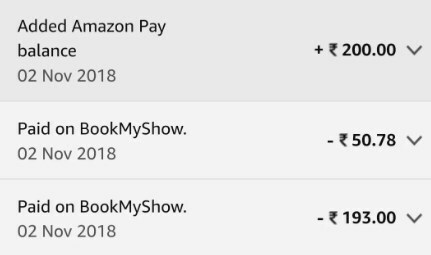 Start booking tickets for your favorite movies at your favorite theater via Bookmyshow and pay via Amazon pay to get 100% cashback upto Rs.200 in Amazon wallet. Note : This is supposed to be a bug/glitch. There is an offer for this where one should buy at Amazon for Rs.500 or more to be eligible for this offer but works even without doing it. 6. Done !! Cashback will be credited in your Amazon account instantly. Do we need to buy any item worth 500 in amazon or is it for all users?